Johnny Manziel couldn't ask for a better team to make his CFL debut against. 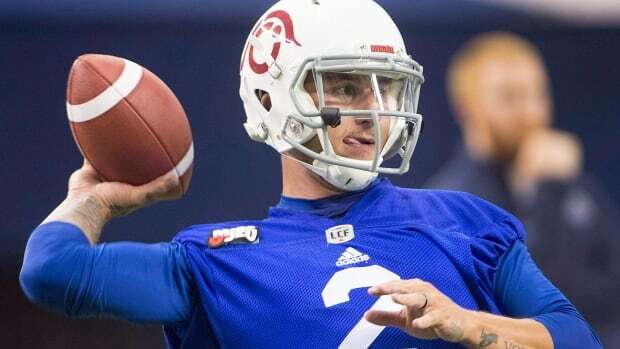 Manziel will make his first CFL start Friday when the Montreal Alouettes host the Hamilton Tiger-Cats at 7:30 p.m. ET. Manziel began the season with the Ticats and remained there until being dealt to Montreal on July 22, along with offensive linemen Tony Washington and Canadian Landon Rice, for receiver Chris Williams, Canadian defensive lineman Jamaal Westerman and 2021-22 first-round draft picks. "I feel fortunate enough this week to be going against a team, a defence that I've seen more than any other defence since I've been in the CFL," Manziel told reporters in Montreal on Tuesday. "I feel like I really know this personnel very well, I feel like I know this team in and out because I was a part of it. "It's definitely going to be a little weird playing against those guys but at the end of the day it's business and I'm in a new home. It will be good to see some familiar faces this week but also a challenge and a very good defence." Manziel dressed for Montreal's 44-23 loss last week to Edmonton but didn't play. Vernon Adams Jr. went the distance, completing 15 of 28 passes for 217 yards and an interception while rushing for 72 yards and a TD on eight carries. Adams, a former teammate of Manziel's in Hamilton, wasn't the least bit surprised by the move. "We all knew he wasn't coming just to sit," Adams said. "We helped him learn the offence as quick as possible, he's still learning. "Now, I'm going to be here for him, back him up. Whatever he needs help with, I'm here for him." Manziel said his relationship with Adams remains solid. "We haven't had a hiccup, we haven't had a hangup, we haven't have an argument, we haven't had anything," Manziel said. "This week it's obviously a different situation for him and I think he's handled it great and he's been supportive to me. "I know that's not easy because I've been on the other side of it multiple times." Manziel made headlines across North America in May when he signed a two-year deal with Hamilton. The 2012 Heisman Trophy winner played in both of Hamilton's exhibition games, completing 21 of 31 passes for 168 yards and a touchdown while rushing six times for 19 yards, but remained on the sideline as Jeremiah Masoli's backup once the regular season began. "We obviously traded for John for a specific reason," said Sherman. "I think we have two very good quarterbacks but we're going to give the nod to John for this ballgame. "I'm very impressed by the knowledge that he does have at this point." The six-foot, 210-pound Manziel was taken in the first round, No. 22 overall, by the Cleveland Browns in the 2014 NFL draft but was released in March 2016 after posting a 2-6 record over two tumultuous campaigns. Friday's contest will be Manziel's first regular-season start since Dec. 27, 2015 when he completed 13 of 32 passes for 136 yards and an interception while running for 108 yards in Cleveland's 17-13 road loss to the Kansas City Chiefs. "I felt like the thing I've been missing … is reps," Manziel said. "I don't think there's anything to be nervous about., I feel like as the game comes around this week I'm going to know what I'm doing on each and every play and know what my job is. "I think there's going to be some times where we're not going to win every single play as the game goes along. There's going to be some mistakes made, that's just the facts of this. I think I'll come out and do some things well and I'm sure I'll have some things I want back. That's just the way that football is anytime and anywhere I've started."